Multifocal lenses replace the eye's natural lens, the procedure is also called "lens exchange". Multifocal intraocular lenses provide relief for presbyopia at the same time as for nearsightedness or for farsightedness. Their goal is to provide freedom from needing any glasses or contact lenses. How does a multifocal lens work? Multifocal lenses: The clearly recognizable rings represent zones with different refractive power. Multifocal synthetic lenses have several points of refraction, hence the term "multifocal". There are two main refractive points, namely the refractive point for close-up vision and the refractive point for distance vision. In order to achieve this goal, multifocal synthetic lenses are made from several individual lenses. 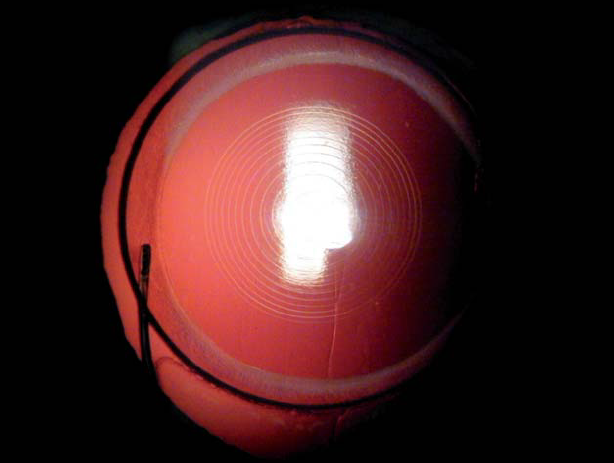 The figure below shows a picture and schema of a multifocal synthetic lens, which is constructed from several rings with different refractive powers. Because of the distribution of incoming light to various refractive points, multifocal intraocular lenses allow focused vision at all distances, ideally without the need for any eyeglasses. However, this comfort has its price: the distribution of light to several refractive points results in a certain loss of contrast. This means that at every point of refraction the image is not seen as sharply as with eyeglasses for that specific distance. How does the surgery work? Multifocal synthetic lenses replace the eye's natural lens, the procedure is also called "lens exchange". At FreeVis, we perform laser refractive lens surgery using a femtosecond laser for the first four steps of the procedure: First, the laser liquifies the natural lens. Next, the laser is used to cut a circular opening into the lens capsule and a small incision in the periphery of the cornea. Finally, the femtosecond laser can also be used to correct an accompanying astigmatism. After the aspiration of the lens material, the multifocal lens is folded and injected into the eye. Once in the eye, it unfolds and takes the place of the eye's normal lens. This surgery is also performed routinely for the removal of opaque lenses, the so-called cataract. Hence, this surgery technique is very reliable and proven. The use of the femtosecond laser further increases its precision and safety. The video demonstrates how the use of the LensX femtosecond laser can improve the outcome of cataract surgery. The implantation of a multifocal synthetic lens is an outpatient procedure. Usually, it is only necessary to anesthetize the eye with eye drops. Surgery is performed on each eye individually, with 2 or 3 days between procedures. On the day of surgery, a bandage is provided for your eye. One day after surgery, your vision is already improved, however final stability is only obtained approximately 8 to 12 weeks after surgery. For whom are multifocal lenses suitable? Multifocal lenses are most often used for the correction of nearsightedness and farsightedness together with existing presbyopia. They can also be used for presbyopia alone, if you desire to be free from using reading glasses. The severity of your refractive error, the diameter of the pupil, the thickness of the cornea as well as other parameters have to be taken into consideration. These parameters are assessed during your initial eye exam at FreeVis. In a detailed consultation with you, we will discuss which procedure is most suitable for your treatment. Generally, patients with chronic and progressive disorders of the eye such as glaucoma and certain retinal disorders should not receive multifocal synthetic lenses. Which problems can occur with multifocal synthetic lenses? Multifocal synthetic lenses do not offer the same image quality as the eye's natural lens and an additional correction with eyeglasses. To a certain extent, multifocal synthetic lenses lead to a decrease in vision contrast. Halos around light sources are described frequently at dawn and at dusk. On the other hand, our brain learns to compensate for this effect so that it is not perceived as bothersome. without the need for additional correction with eyeglasses, and in that sense it is superior to the natural lens of the eye at an advanced age. The multifocal synthetic lens is constructed in such a manner that distance vision is better than close-up vision. The goal is that you will not experience any problems, for example when driving an automobile. In many cases, reading glasses are no longer needed after a certain learning phase. On the other hand, reading glasses are often preferred for reading over extended periods of time because such reading would become difficult after a while. Please note that the procedure involves a surgery in the inner eye, meaning that in extremely rare cases, severe side effects are possible. What can you do to see well with multifocal lenses? Do not rub on your eyes for the first few days after surgery. Apply the eye drops regularly as prescribed by your physician; only use the eye drops for the amount of time specified by your physician; extended use of this powerful medication may be harmful to your eyes. Keep appointments for your postoperative eye exams. Schedule a checkup once a year so that possible long-term effects can be detected early. Contact your physician immediately if you experience severe pain or a sudden decrease in vision. such as glare and halos at twilight and at night, an infection, an increase in internal pressure of the eye, opaqueness of the cornea or secondary cataract. The treatment costs for vision correction surgery are generally not reimbursed by the statutory health insurance. This also applies to the initial (pre-op) consultation and follow up exams after the procedure. The treatment is billed according to the doctor's fee schedule (GOÄ). Please feel free to request the costs for the intitial examination and the surgical procedures here.